Taking the entire process into account this was the hardest part of the costume, but since I did almost all of the hard work back when I first sewed it in 2010, I didn’t have to do much this time around. To summarize the original process, I wanted to make eight tentacles (though she only has six in the movie– weird), each completely separate, but intertwined with each other to form the bottom of the skirt. I sketched out the way I wanted the tentacles to intersect, then re-drew each tentacle separately so I’d know what shape to cut it in. Then I used black satin and purple foil dot fabric to sew the tentacles. I stuffed them with polyfill and styrofoam packing peanuts, then hand-stitched them in place on the skirt of a black strapless bridesmaid’s dress. Anyway, while the costume itself still fit reasonably well, I didn’t need the strapless bodice under the wedding dress– so I decided to make it into a skirt. 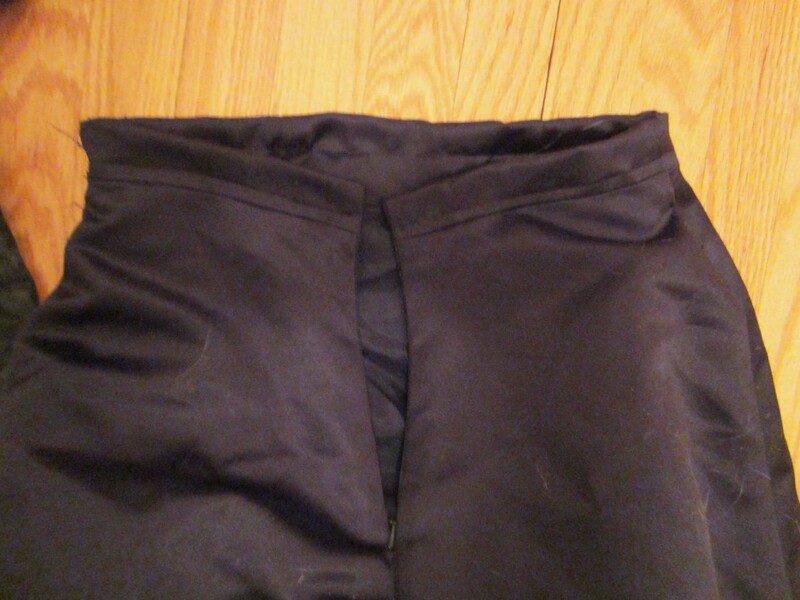 I just cut off the bodice about two inches above the waist seam, folded it over, and stitched it down to make a waistband. I added a hook and eye at the top of the zipper, and voila, I was done. I got some more packing peanuts (you can buy them by the cubic foot at U-Haul) and re-filled the tentacles, leaving the upper portions of the back ones empty since they weren’t going to show, then stitched them closed by hand. Next up– finishing the dress. 1. I originally filled the tentacles entirely with polyfill, figuring that its soft texture and resulting smooth surface would be ideal. However, pillow stuffing can get really heavy if you use a lot of it, and it made my tentacles far too heavy for wear. I definitely recommend using polyfill only for the pointed ends of the tentacles and perhaps as a thin layer of padding in certain areas that need a smooth look, and going for the much lighter packing peanuts to fill in the bulk of the shape. 2. One great feature of the original dress was the interior structure, which included a separately boned mini-corset thing. It had its own zipper, and was basically like a long-line bra that was attached to the dress. It really helped to keep the dress in place without shifting or pulling downwards due to weight, and kept any stress off the outer bodice fabric. 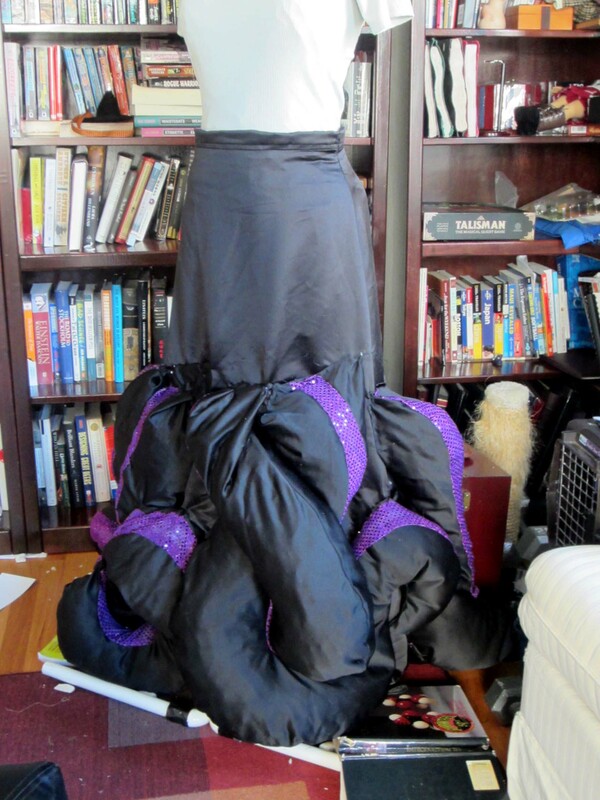 If you’re going to get a strapless dress to use as a frame for a heavier costume, keep an eye out for this feature. HI. Love the costume, but i have a question. I’m making an Ursula costume, and I’m wondering if your could be so kind as to post a a tutorial on how to make the tentacles. I’m going to make the tentacles start at my waist and go down maybe to my knees, with black tights underneath. Thanks! Sadly, I made them so long ago that I don’t have a tutorial. The trick (which you can kind of see in my first post about the original costume) is to cut your tentacles out in the correct shapes to intertwine around your legs. You can’t just cut them out all in the same shape and hope to twist them around each other afterwards. I drew a picture of how I wanted the tentacles to intersect, and then separated out each tentacle and drew it alone for a pattern. The basic technique is to draw the tentacles in 2D and cut out the front and back in black fabric, stitch one side together, then take a strip of purple fabric and bridge the gap between the two black sides. That makes it more 3D when you stuff it. I stuffed the tips with pillow batting and did the rest in styrofoam packing peanuts to keep them light. Good luck! Thanks so much. That actually very helpful. A bunch of people and I are going as Disney Villains, and I was lucky enough to get Ursula. Thanks for your help! quick question. About how many tentacles do you have on your costume? I had eight tentacles, though the Disney Ursula actually only has six (apparently it made her easier to animate). Hmm, good question. It was a long time ago, so I can’t remember exactly. I think I bought three yards of the black satin and maybe 3/4 yard of the purple sparkly stuff. The purple was cut into (I think) 5″ strips, and I used different lengths of purple on each tentacle, depending on how it curved.